Do you ever feel as though you are being watched? We’ll get to that later. We lead wildly varied, compelling, interesting, fascinating weird and frustrating lives. We are authors. We meet and talk with top law enforcement people, hobnob with some of the worst criminals of the era and we are privy to many government secrets. We are authors. We spend our lives in mean garrets, chewing beef jerky strips and slurping weak tea, or sitting pool-side with slippered feet, being served mimosas and crumpets by a bevy of nearly dressed models. Yes, we are authors. None of these scenarios are, in my experience, wholly accurate. Neither are they entirely incorrect. In my admittedly limited experience, authors are likely to be a broad mix of life’s experiences. Indeed so, and I’m limiting my remarks here to my personal life and observations of authors of crime fiction. Your experience may vary. A friend who has achieved broad success as an author has a fairly precise routine. In the morning, he repairs to a nearby coffee shop to write, often long-hand, for a few hours. Every day. Even when he travels, he tries to find the time, in the morning, to write. I have a similar routine. Because I started my fiction writing while I was employed full time, and because I wanted access to most of my psychic energy, I established a routine of rising early in the morning and writing for at least two hours before leaving for the college. Now retired, I still spend at least a couple of hours in the early morning, at my computer, writing a story or working on my current novel. Or, like this particular morning, working on the draft of this article. So, here’s my typical scenario. I consider myself a typical (hah) author of crime fiction. I’m also a small-time publisher and I review crime fiction for several sites. Mornings, because my energy levels are higher, I write. Most mornings I’ll work at any of several writing projects that are current. I have no specific goals—number of words, number of pages—so I accomplish whatever I accomplish. Afternoons I read, do research, write reviews or short pieces, address a variety of tasks associated with being a writer and publisher. The telephone, rings, the carpet needs vacuuming or dishes must be washed. Yes, it may surprise some, but most of the working authors I know, those who try to publish a new book every year, also have ordinary or routine lives. And they travel to make presentations to groups, appear at conventions, answer fan mail and attend to family life. Readers of this piece should not be surprised to learn that most active authors of crime fiction lead fairly ordinary lives, although we may sometimes experience a heightened level of frustration at our experiences with the publishing world. Be that as it may, among the joys of being an author, is our opportunity to do research. We develop access to experienced members of the legal, law enforcement and business communities that many citizens may never experience. Such contacts are not always in the most pleasant circumstances, visits to autopsy labs, for example. But in general, most of the successful authors I know like to learn things and we are always watching and listening. Waiting at the airport to board an airplane, I overheard a six-word jargon-laced phrase from a passing vendor. That phrase triggered an explanation of important actions in a story I was working on at the time. Yes, when you are around authors, if you get the feeling you are being carefully watched, it is probably true. Come and enjoy a time of conversation with author Carl Brookins as he talks about translating his sailing adventures to fiction and creating fictional characters that feel like old friends. 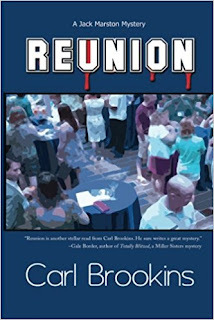 Brookins is a member of Mystery Writers of America, Sisters in Crime, and Private Eye Writers of America. He can frequently be found touring bookstores and libraries with his companions-in-crime, The Minnesota Crime Wave.